Welcome to another installment of If My Book, the Monkeybicycle feature in which authors shed light on their recently released books by comparing them to weird things. 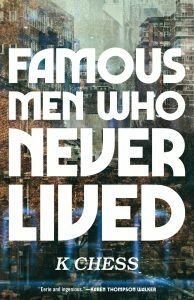 This week K Chess writes about Famous Men Who Never Lived, her debut novel just published by Tin House Books. If FAMOUS MEN WHO NEVER LIVED were a street food, it would be chicken and rice served with generous squirts of white sauce and hot sauce, all in a Styrofoam box with a little plastic fork and a napkin on top. If FAMOUS MEN WHO NEVER LIVED were a newspaper headline, it would have a pun in it. If FAMOUS MEN WHO NEVER LIVED were a bar, its interior would be painted black, with a pressed tin ceiling. In the bathroom of FAMOUS MEN WHO NEVER LIVED, if you looked right into the sink, you’d be able to spy the cap from your favorite lipstick that you’d dropped down the drain once. You’d see it every time, but you wouldn’t quite be able to reach it. If FAMOUS MEN WHO NEVER LIVED were a panhandler, it would carry a cardboard sign with a message in marker spelling out “need $52 for bus ticket home.” But that would be a lie, the specificity a calculated deception. If FAMOUS MEN WHO NEVER LIVED were a bodega, its ATM would charge a convenience fee, but its employees would always ring you up for a small coffee, even if you got a large. A fat yellow cat would live inside FAMOUS MEN WHO NEVER LIVED and would bask across the freezer where the popsicles were kept. If FAMOUS MEN WHO NEVER LIVED had to get somewhere late at night, it would walk the subway tunnels under the East River. It would press itself back into one of the niches when the F train went by. If FAMOUS MEN WHO NEVER LIVED were the night sky, it would swirl with glowing, electric blue clouds. People would look at it and think aliens had landed in Queens. If you asked FAMOUS MEN WHO NEVER LIVED for directions, it would tell you where to go, but it would never stop to ask if you were lost. It wouldn’t want to assume. K Chess was a W.K. Rose Fellow and her short stories have been honored by the Nelson Algren Award and the Pushcart Prize. She lives with her wife in Providence, RI. Famous Men Who Never Lived is her first book. Find out more at kchesswriter.com, or follow her on Twitter at @kchessok.